These days, having our good friends over for a festive night in is one of our favorite things. We've even started a bit of a tradition - making several different types of pizza on our favorite pizza stone. Throw in some nice wine and a little music, and it's a party. When you're in good company, there's nothing better than a relaxed dinner at home. 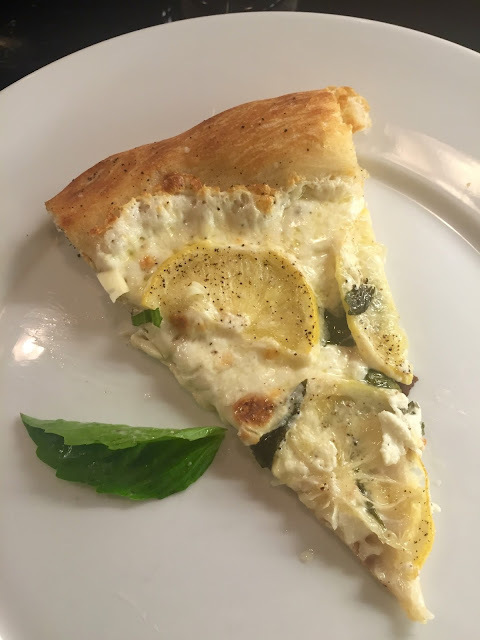 For the menu, I reverted to several Neurotic Kitchen favorites that were a hit last time my friends were over, and added one new kind of pizza that will inevitably join the rotation. 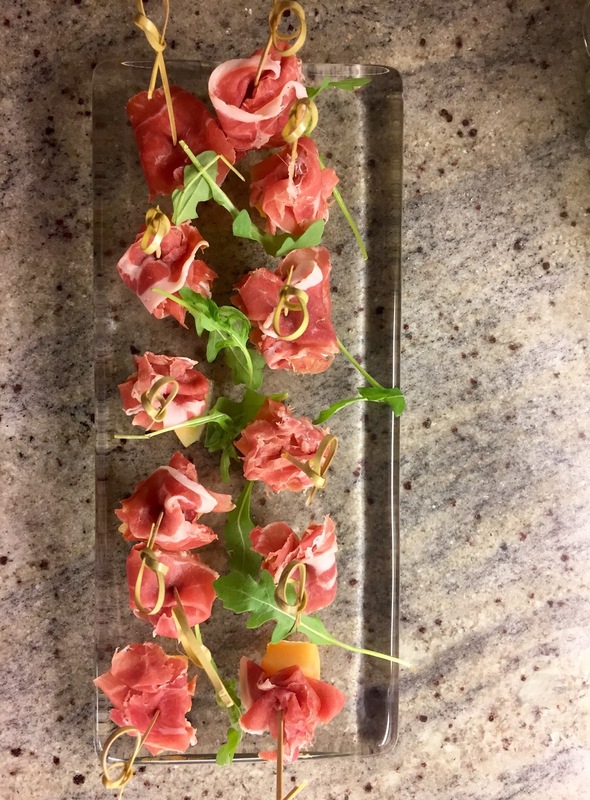 As always, I put out some pre-dinner nibbles that I tried to keep easy and elegant. Pro-tip for pizza happiness: spend some time finding the very best ingredients because pizza truly is the sum of its parts -the best building blocks make all the difference. And please, if you'd really like to make this easy, don't be a hero by making your own dough - that's crazy talk! Just head into your favorite bread bakery or pizza shop and buy theirs. The better the dough, the easier time you will have. For sauce, I use very simple jarred pureed tomatoes - as long as you season your pizza appropriately, there's no need to use a real sauce. 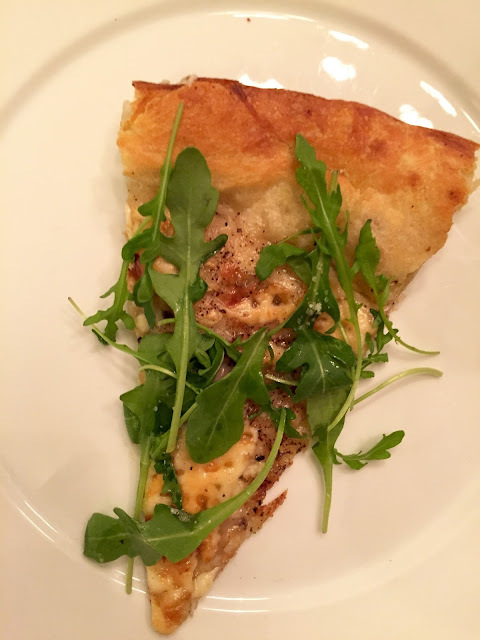 And finally, the experiment of the night - Pizza with White Truffle Cream, Asiago & Arugula (the recipe is below). 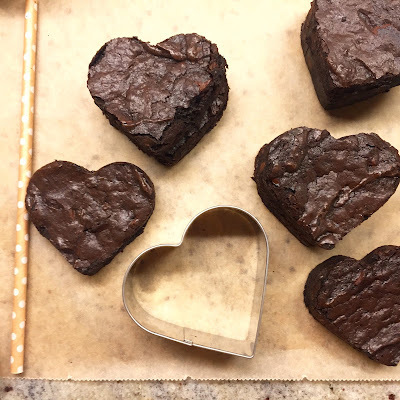 We can't forget dessert, which was none other than our favorite Deep Dark Chocolate Brownies. Easy, fast and seriously decadent!! Too wild? Well I like to believe that there isn't anyone out there who wouldn't love the flavor of truffles, so check our latest successful kitchen experiment, this truffle pizza that I have been imagining in my head ever since my sister-in-law gave me a can of this very delicious White Truffle Cream from Urbani Truffles. Place pizza stone in the oven. If not using a stone, prepare pizza as normal in a pizza pan. Turn oven on to 525 with the rack placed in the middle, or to highest temp your over can handle. Preheat the stone for 30 minutes. Flour a clean counter top and your hands. Place extra flour nearby. Form Pizza Dough into a ball. Press it down onto the counter and continue pressing until you have a flat round. Form dough into your desired pizza shape, making it as thin as possible - ideally an eighth of an inch thick. Pinch the edges of the dough all the way around to form a crust. Check out this great video I found on the web for dough-handling pointers HERE. Once Pizza Crust is formed, carefully transfer it onto parchment paper that is cut to a size just slightly bigger than the dough shape (enough to grab it on each side). If you are using a pan and no pizza stone, you needn't do either of the preceding steps. Drizzle a Tablespoon or two of Oil onto the dough. Using a paper towel, spread the Oil around the entire surface of the dough. 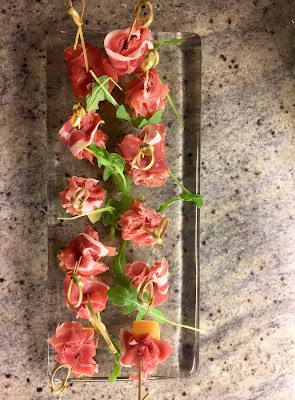 Using a Tablespoon, slowly spoon on a thin layer of White Truffle Cream and spread it all around. The dough should only be thinly covered. Grate some fresh shavings of Asiago generously all over the pizza. Transfer the parchment paper with the Pizza on it to the pizza stone and allow to bake for 10-13 minutes until crust is golden brown and crispy. Remove Pizza and stone from the oven, and allow to cook a few minutes until Asiago Cheese looks stretchable rather than liquified. Pile on Wild Arugula Leaves and drizzle very lightly with Olive Oil, then again with Balsamic Syrup. Slice and serve right away! Bring Vinegar to a boil in a small saucepan. 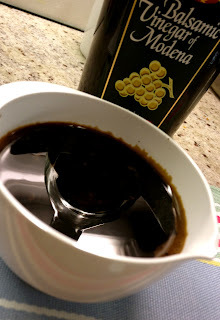 Cook, stirring often, until the liquid is reduced and somewhat syrupy. This should take about 5 minutes. Keep an eye on it. I once ended up with completely solidified vinegar! Storage – the reduction can be stored in an airtight container in the fridge for a few weeks. It should be brought to room temperature before using. 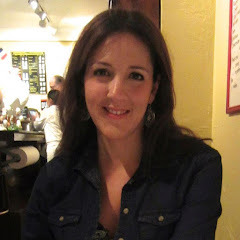 Big News: Neurotic-Mom.com is here! Neurotic Kitchen now has its very own kids' table!! 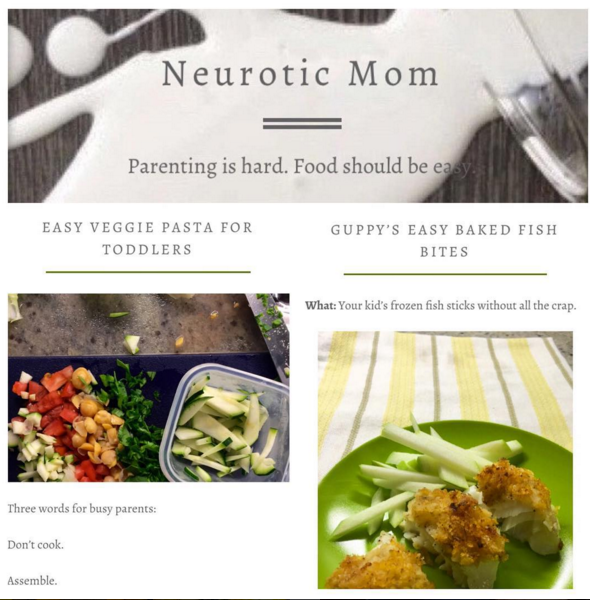 I am happy to announce that www.neurotic-mom.com is live and tackling the tastebuds of picky toddlers, one kid at a time! Come check it out and enjoy our easy, fast and wholesome recipes for happy, well-fed babies and kids, plus plenty of tidbits on how to keep a healthy home. See you there! Because Parenting is hard. Food should be easy. This is the mantra I always return to in attempting to keep my hors d'oeuvres simple and largely make-ahead so that I too can enjoy my own parties instead of being stuck in the kitchen. 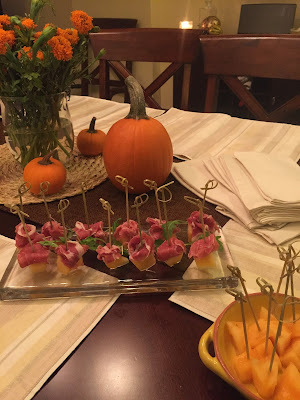 This smart strategy comes directly from Ina Garten, one of my easy entertaining muses. I had to have it. And because I could see that Jonathan Waxman's celebrated restaurant's creation was composed of just a few basic elements, I didn't feel compelled to try and hunt down the recipe. Instead, I thought about the big components (meat+potatoes+greens), and considered the food items I already had on hand (mainly, a very nice and comparatively affordable London Broil we'd grabbed on sale). 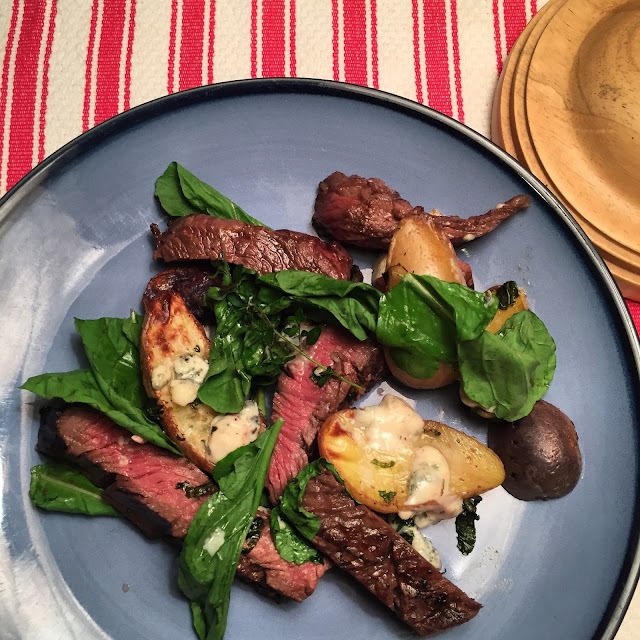 From there, I created my game plan (London Broil lends itself to marinating) and a short shopping list (Mixed Potatoes, Arugula and Bleu Cheese). A few hours later, we had ourselves one delicious weekend dinner. The moral? When you don't get hung up on achieving perfection wonderful things are bound to happen. Am I neurotic? Definitely. Do I often overthink my cooking? Sure. I do it so you don't have to. 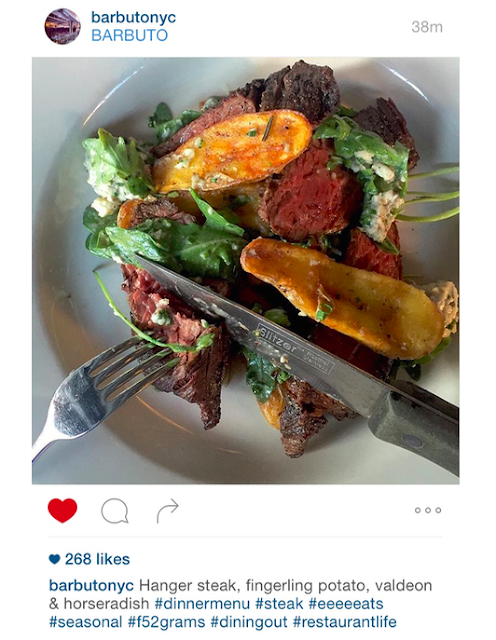 That's what today's meal is all about --- finding food inspiration and running with it. The largely visual world of the internet is great for this. From Pinterest, to Instagram to good old cooking mags, there's nothing wrong with using images to assemble your own winning recipes - your way. Do so without fear of failure. Keep things basic and build on what you know. The results will probably surprise you. The below is not really a recipe as much as a roadmap - don't hesitate toT put your own twist on it and have a little fun. 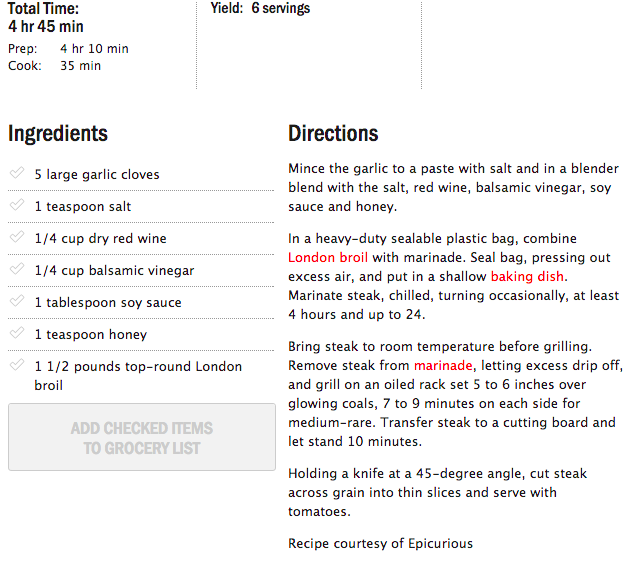 Step One - MARINATE - Prepare the Marinade as below and let London Broil sit for 4 to 24 hours using the Epicurious recipe below. You can also feel free to sub-in any well flavored grilled Steak that suits your taste (Hanger Steak as in Barbuto's original dish, or others such as Flank or Skirt would be great choices). Step Two - Start your grill for the Steak (or ready your stovetop grill pan) and Preheat the oven (450 degrees for your Roasted Potatoes). Now prepare your Greens - Spinach, or Arugula would be good choices. Wash them, dry them and place them in a bowl. Sprinkle with a little Olive Oil, Salt and Pepper. Set aside. Now roast your Potatoes -- toss 2.5 Lbs of assorted small Potatoes, cut in half if you like, (we used Purple Potatoes, Fingerlings, and Baby Yukon Golds) in Olive Oil, Salt and Pepper and BAKE them until tender - for about 30 minutes at 450. About 25 minutes before they are done, begin grilling the Steak until medium-rare (see timing and directions ABOVE). When it's finished and medium rare let it rest for 10 minutes. Slice Steak against the grain. Step Three - Serve - Arrange all ingredients on the plate as pictured and sprinkle with crumbled Bleu Cheese. If plates have gotten cool you can put them in the oven for a minute to rewarm. You know the drill. There's a chill in the air so it's time to psych ourselves up for fall. We'll gloss over how it's the inevitable start of the soon-to-be interminable winter season, and focus on the good - pumpkin beer, great produce, cozy dishes and beautiful foliage. Fall is also the time of year where I get a hankering for soup. 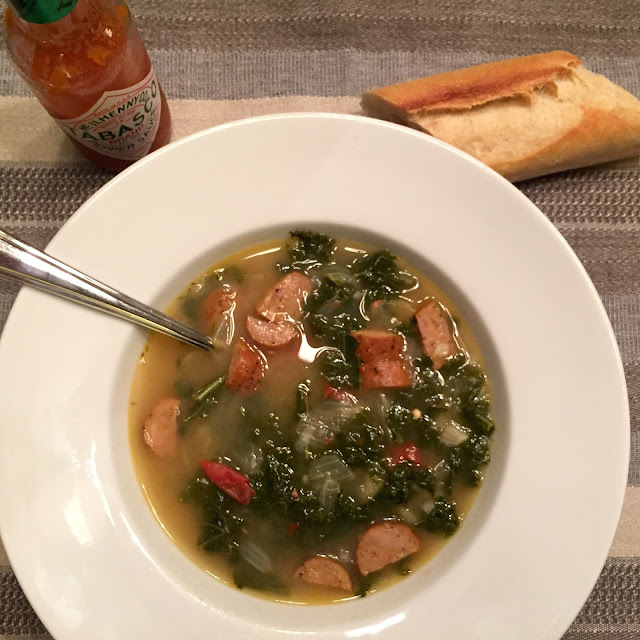 Inspired by a loose interpretation of a traditional Portuguese dish called Caldo Verde, today's comforting soup combines Kale and spicy Andouille Sausage. It is SO easy to make and even better, it's super fast. Now, hold the phone...it's got BEER in it. Are you sold? Whip up a batch this weekend and it will feed you for days. 1. In a large pot heat Oil over medium flame. Add the Onion and saute for about 3 minutes, stirring occasionally. 2. Add the Red Pepper Flakes and Garlic and cook until it starts to be fragrant, approximately 1 minute. Add the Broth, Beer, and Potatoes and bring to a boil. Lower the flame and simmer about 10 minutes until the Potatoes are tender - a few minutes additional if they require it. 3. Add the Kale and Sausage and cook until Kale is wilted, another 5-7 minutes. You can leave the soup on a very low simmer until you are ready to eat but be sure to cover it. 4. Before serving, taste for seasoning and add the 1/4 teaspoon Coarse salt or more to taste if needed. The salinity of Sausages can vary so use your judgement. Serve with some Louisiana Hot Sauce such as Tabasco and crusty Bread for dunking!